Mountain Christian Church is an active and influential leader in their community, as well as the North American Christian Convention. Preliminary conversations began in fall 2014, and by summer 2015, the project had been approved and we were head deep in details. 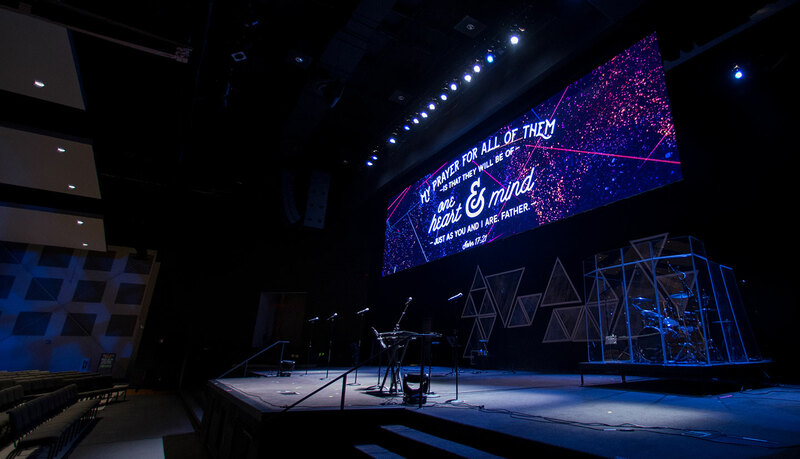 While this was not our first project with the church, this would be the largest and most critical upgrade since it dealt with their main broadcast auditorium. The primary goals of the project were a complete SD to HD Migration for broadcast quality video, updating the audio system to provide a more consistent experience throughout all of the seating areas, and a theatrical lighting plot that would be broadcast video centric. Finally, an overall system upgrade that would allow virtual teaching playback at the main campus, which already takes place at the satellite campuses. The audio system was the first element designed, as the speakers would directly impact sight lines for video screens and lighting. Once the PA was taking shape, we designed the remaining elements to maximize engagement in the room. Behind the scenes, we discovered early on how the current control and machine room spaces would not be sufficient for the new systems. So, we selected a new space that could accommodate future growth. Our deploy process occurred over a four week period. During this time, we coordinated our implementation schedule to ensure the church could continue to meet in the space during the entire process. To maximize efficiency, we pre-built the entire system ahead of time at our headquarters in Franklin, TN. We also conducted preliminary system training and configuration for the church at our headquarters before the system was packed up and sent to the site. The L'Acoustics amplifiers provide a unique feature where the correct operation and health of the system can be verified through network manager software. This allows our team, utilizing Guardian by Mankin, to proactively ensure the longevity of the church's investment. The video system is built around one of the first installations of the Ross Ultrix routing system for both video and multi-channel audio routing, as well as on-board multi-viewers – all within the same frame. A Ross Carbonite switcher is used to tell the story from images captured by Ikegami HD-300 cameras and numerous Renewed Vision/Apple/Blackmagic Design graphics stations. Terminal equipment from Ross, AJA, Decimator, and Blackmagic round out the guts of the system. 138 Panels of CreateLED 3.9mm AirMAG LED comprise a 37ft by 10ft video canvas that envelops the room. What makes this screen especially unique is it’s ability to be broken up into three distinct surfaces – an 11 panel wide center screen and two 6 panel square side screens – with Kinesys motor control allowing each of the screens to move up and down to pre-programmed locations. A L’Acoustics Kara loudspeaker system, along with several X12 and X8 flown fills and 5XT front fills, provides concert level quality for the room. One unique design implementation is there are no ground subs in this system, because the existing stage was not conducive to it. Instead, there are two clusters of L’Acoustics SB18’s flown directly behind the main arrays to provide tightness and punch. A large Dante network is utilized for signal distribution between a Yamaha CL5 at FOH, a Yamaha TF5 at monitor world, Shure wireless mics, and Aviom personal monitors. Our team designed a new lighting plot for the room, utilizing all of the existing ellipsoidals and LED fixtures. This included new positions for both front and top light, as well as static crowd wash and gobos. Another unique variable in this room is how the auditorium is actually a gymnatorium – doubling as an activity center during the week. As such, the entire FOH – including camera platforms and fill displays – had to be designed to allow for them to be struck and stored. We designed a custom, fiber-based system that allows connection of every signal required at FOH over 4 OpticalCon Tactical Fiber Optic Cables, making setup and tear down simple, and signal distribution extremely low profile. There is always a learning curve when implementing a new system of this size and scope, especially retrofitting an existing space on such an aggressive timeline. However, the Mountain team has met the task with dedication to excellence. These tools have driven their team to push for even higher levels of excellence in their service content and production.